In this second part of the 2 part series about syncing Pro Tools systems, we go over syncing the systems over a network connection. This does have the advantage of needing 2 interfaces with Midi I/O, but does require a bit more setup and a single network cable or for longer distances, you can connect the systems into a common hub or switch. 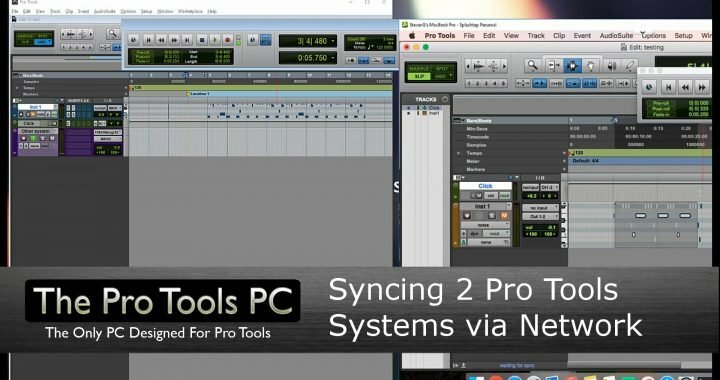 Syncing 2 Pro Tools systems is an easy way to gain processing power. The most common use for this would be to host VI's on a slave system and then stream them into the master system. If you have an older Pro Tools system around, this would be a good way to get use out of it! We need a couple programs to get full control of a Mac and a PC onto a single system. I use the the screen sharing program from splashtop. Use "Personal" on the master system and "Streamer" on the slave. On the PC, we use rtpMidi for MTC over network. This is built in on Mac through the Audio Midi panel. You will also need to have the audio connections between the system setup correctly. From there, enabling MTC (Midi Time Code) setup correctly within Pro Tools. The master system will generate MTC and the slave will read MTC. Then we will need to turn MTC on within the transport in Pro Tools and tell the master to Generate MTC and the slave to "Wait for Sync." This is covered within the video. If you are familiar with the previous video on this sync topic, it is an almost identical setup. The difference is that you would select the Bounjour name you created in the rtpMidi/Network setup steps. I hope these videos were helpful and give you some ideas. It is a great use if you have any older Pro Tools systems around. Even Pro Tools 6-7-8 systems you might still have around have the identical setup and completely usable. If you have some topics you have interest in or curious about, let us know! Don't forget, TRASHER has been updated for Pro Tools 2018 and is both PC and Mac compatible!!! As of 3-6-18 TRASHER has been updated to build 18. It now includes a Progress Bar, buttons to Tick/Untick all boxes, new Operating Instruction manual, general code cleanup. You can find more information here or go directly to the download page here. Posted in News, Tutorials and tagged Avid Pro Tools, midi, Network, PC and Mac, sync, Tips, Tutorial, Video.